Government of India may claim that the country’s gross national product (GDP) during 2015-16 grew by 7.56%, one of the highest in the world. However, Credit Suisse, a Switzerland-based multinational financial services group, has said that, in real terms, there was a decline of 0.8% in the country’s total wealth in 2015-16. Estimating total wealth of India at $3,099 billion in 2016, the MNC in its Global Wealth Report 2016, brought out by its research wing, says that in 2015-16 there was a downfall of $26 billion. India’s fall in total wealth comes about amidst a rise of 1.4% globally, mainly on account of a whopping increase of 8.3% in the Asia-Pacific region and 2% in North America. 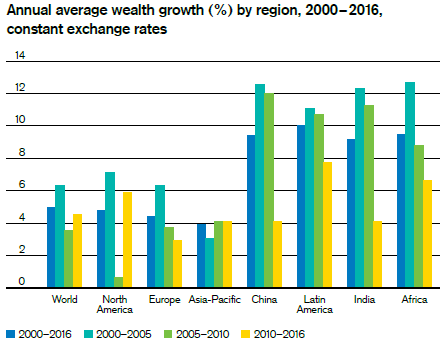 During the same period, the MNC research estimates, India’s wealth per adult went down by 2.8%, as against a decline of just 0.1% globally. India’s wealth per adult stood at $ 3,835 in 2015-16. “The country has 248,000 adults in the top 1% of global wealth holders, which is a 0.5% share. 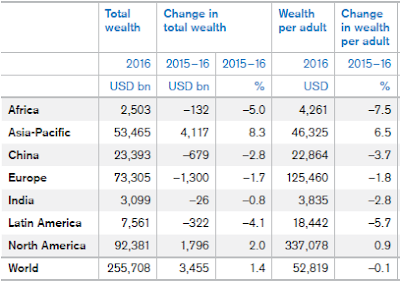 By our estimates, 2,260 adults have wealth over USD 50 million, and 1,040 have more than USD 100 million”, the report says.